has beated the Derbywinner 1989 Lartigue Note twise (when he ran on the Dunmoretrack on the time 23,44, 398m) and many other stars both in Ireland and in England. "Prince" debuted in Open Race and raced after that only in this class. He won six of his seven trials, and has on 51 starts won 19 races and there among a bunch of Cup titles. "Prince" was one of the best litters (who has won the most) after Whisper Wishes and therefore he got the price as "Studdog of the year" for the third time. "Prince's" father Whisper Wishes won the English Derby in 1984 and is seen as the best that has ever been in both racing and in stud. Hes mother Duffers Daisy is a coursingbitch. 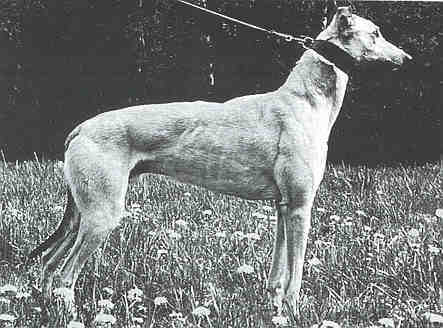 She is after the great dog Duffers Ranger, he stands in a class of himself in stud when we look at the coursingside. Duffers Ranger, as well as his litter Crafty Thrillers deacents has whiped clean on the coursingtracks.